A couple of years ago, I wrote a thesis on in-game advertising. One chapter about history didn't make it into the final version, but now you can view and download the entire chapter in its original format, complete with proper references. Here, I am publishing a series of excerpts, illustrated, where possible, with screenshots and gameplay videos that have began to appear on YouTube. This first installment deals with the early years of advergames. The next one will be about brands and arcades. The exact moment when third-party brands become part of the games is hard to pinpoint. The Internet Pinball Machine database that lists 4,832 different units contains images of the Mustang (1964, Chicago Coin) machine. It is unclear whether the makers licensed the brand name of the Ford’s new sports car that appeared in April of the same year but the website describes it as being about car culture, and the game’s playing field and backglass art incorporate images of cars that look similar to those early Mustang models. While this cameo was most likely a joke of an anonymous programmer and wasn’t sponsored by the fast food empire, the “only McDonald’s on the Moon” was probably the first instance of a brand integrated into the gameplay. 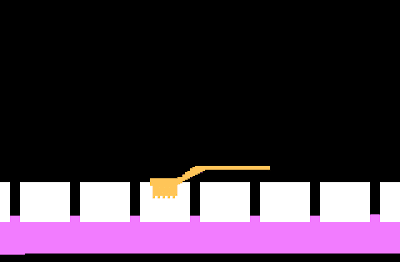 It is not clear whether this Easter egg (as hidden features are known) survived the subsequent commercial adaptations of Lunar Lander (the game was made an arcade by Atari and was also distributed on tapes for Apple I), but for McDonald’s it marked the beginning of a long involvement with the medium. Arcade cabinets would become commonplace in its restaurants; the company recently initiated a trial of McImagination game kiosks shaped to resemble corporate characters. 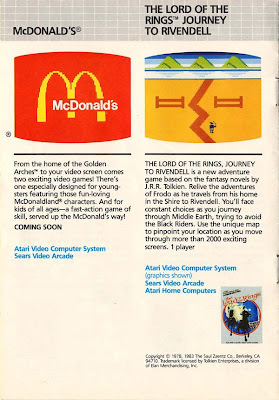 In 1982, McDonald’s teamed up with Atari for a nationwide contest in which the restaurant gave away 12,000 video game consoles and home computers worth over $4 million. In 1983, Parker Brothers was working on a McDonald’s-themed game with Ronald feeding hungry aliens with shakes, fries and hamburgers and with the aliens biting into the Golden Arches, but apparently the game failed to generate interest outside the 8-9 year-old demographic and the project already advertised in the catalog was scrapped. Regardless of whether the lunar McDonald’s was authorized, by the early 1980s video games had become a large enough part of popular culture to attract at least a few marketing minds at mainstream companies. Around 1983, Coca-Cola approached Atari to produce a game to be given away as a gift to the participants of Coke’s sales convention in Atlanta. Atari came up with a special version of Space Invaders, a blockbuster game that had sold millions of copies since its release a few years earlier. The rows of aliens were replaced by the letters P, E, P, S, I and the command ship above them was replaced with a Pepsi logo. The player controlled a ship whose goal was to shoot down as many enemy characters as possible within the three-minute limit, after which the game would end and the message Coke Wins would flash across the screen. Only 125 copies of Pepsi Invaders were made, but the game eventually trickled down into the broad gamer community. The other game was by Ralston Purina whose commercials for Chuck Wagon dog food featured a tiny wagon rolling out from a bag of dog food and across the kitchen floor. The commercials apparently were so popular that the company decided to turn it into a computer game with the wagon as its main character. The game was appropriately titled Chase the Chuck Wagon. Finally, there was Kool-Aid Man made by M Network for General Foods. It, too, was tied to a commercial in which a giant pitcher was breaking through a brick wall and served Kool-Aid to everyone in the vicinity; the concept was reiterated on the game’s box art and in the opening sequence. In the game, the Kool-Aid Man fought evil Thirsties who were stealing water from a swimming pool. Whether these three games were a marketing success is hard to tell. Distributed for free in exchange for proofs of purchase, they are now considered collectible rarities unlike many other Atari titles of that period, so the companies probably didn’t send out too many units. One of the reasons why these games didn’t do well is their bad fortune of being released during the unraveling of the game industry known as the Video Game Crash of 1983. In 1982, when these titles were probably commissioned, the industry was at the peak of its popularity and profitability; that year, the American public bought $3 billion worth of games (over $6 billion in today’s money), tripling the previous year’s amount. The news media sensationalized the boom and many companies rushed to open video games division to capitalize on the tidal wave; Quaker Oats, for instance, acquired US Games and presented eight titles, mostly clones of the existing hits, at Chicago’s Summer Consumer Electronic Show of 1982. The market became saturated with bad games and numerous variations of the same concepts, and the next year the sales dropped to $2 billion, and then to $800 million in 1984 and $100 million in 1985. Quaker Oats’ game division lasted one year. Very intersting post when you look at how far things have come today. The concept of McDonalds on the moon is kinda fun actually... I wanna see it happen by 2020! Go NASA! Informative post - thanks! I didnt realize that the concept of advergaming has been around for so long. How Much Would You Pay For Free? 100 Million Hours of Ads a Weekend? Are You a Digital Media Ninja?